On March, 11, 2017, approximately 5:05 PM Kalamazoo Public Safety responded to a report of an unarmed robbery in the area of Reed and High St. The victim reported that while walking in the area, a car stopped and several juveniles exited it. A male juvenile walked up to the victim and ripped her purse off her shoulder and ran back to the vehicle. A witness was able to give detailed information on the vehicle. A Public Safety Sergeant and Officers located the suspect vehicle in the 800 block of S Rose St. Officers attempted to make contact with a 16 year old male juvenile and a 15 year old male juvenile who both ran upon seeing the police. They were quickly apprehended and the victim’s purse was located and returned to her. A 16 year old male was arrested for unarmed robbery and resisting and obstructing. He was lodged at the juvenile home. A 15 year old was turned over to his legal guardian and will be facing the charges of resisting and obstructing. Kalamazoo, MI: On Saturday, January 9, 2016, at approximately 12:15 pm, Kalamazoo Public Safety received a 911 call reporting that a young male was carrying a pistol as he walked along Kings Highway; this initial 911 call sparked a lengthy investigation that concluded with the arrest of three young males on a gamut of felony charges. The below news release is lengthy but depicts what occurred over the span of a twelve hour period. The initial 911 caller reported seeing five young males walking along King Highway near the Red Arrow Golf Course; one was clearly caring a black hang gun. Officers had already been dealing with a rash of vehicle break-ins, property destruction, and vandalism in several areas of the city. Vehicle windows had been broken, cars had been broken into, people had been shot….all initially looked to be the act of one or more people using BB guns to raise havoc. Several officers set up a perimeter around the golf course area (Mills, King Hwy, River area) and observed from a distance. Officers confirmed that at least one of the subjects was armed a black hand gun. The males appeared to be in their young teens. Five were walking together. The group began running from the officers. As they ran handguns could be seen being thrown; two onto dry ground and one into the Kalamazoo River. All five suspects were captured, detained, and a lengthy investigation ensued. 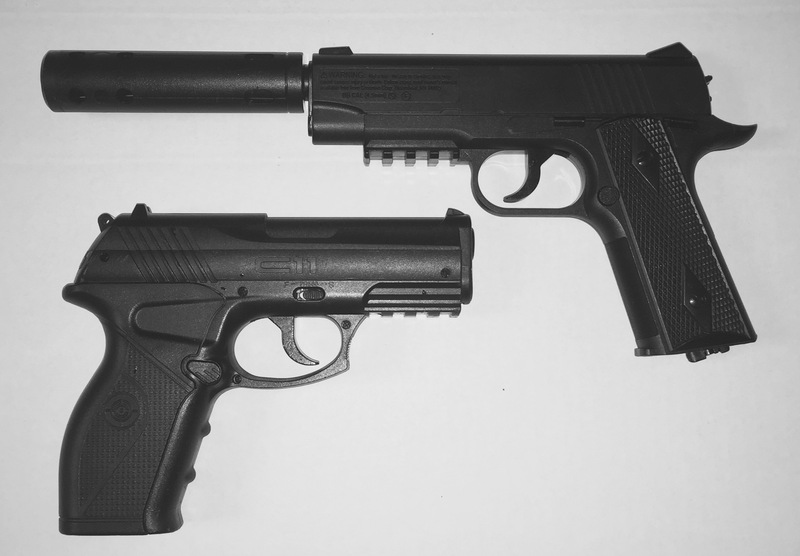 Two BB pistols were recovered as was stolen property. Ten officers from Kalamazoo Public Safety, in coordination with Kalamazoo Sheriffs Deputies and Kalamazoo Township Officers determined the following: The three teenage males stole three CO2 powered, semi-auto, BB pistols from a retail store on Gull Road around mid-night. They then drove around the Kalamazoo area shooting out vehicle windows, shooting at homes, shooting at people, only pausing at times to steal items from cars. The suspects fired from out of the moving vehicle’s open windows and the open sun roof. At this time officers have linked the three suspects to over 45 cases. No people were significantly injured from the flying BBs but property damage is in the thousands of dollars. The group’s instigator, a 13 yr old Kalamazoo resident, was just released from the juvenile home on January 8th for similar crimes. The second suspect is a 15 yr old Kalamazoo resident and the third is a 17 yr old Three Rivers resident. The three were driving around in the 13 yr olds family vehicle. Kalamazoo Public Safety reminds the community to say something if you see something. 45 felony cases were solved and further damage was prevented because someone took the time to call 911. Anyone who may have information regarding this incident, or information regarding other crimes, is asked to contact Public Safety at 337-8994 or Silent Observer at 343-2100 or www.kalamazoosilentobserver.com.